The less time is left until elections in Ukraine, the more measures Kiev’s top officials take to break ties with Russia. Speaking at the 11th Kiev Security Forum, Petro Poroshenko charged preparing suggestions in cooperation with the Cabinet to terminate Ukraine’s membership in CIS Statutory Bodies and close Ukraine’s representations at relevant institutions in Minsk after CIS refused to recognize what Poroshenko calls “Russian aggression.” On the first days of May, Poroshenko charged Foreign Ministry to recall Ukraine’s representatives from CIS Statutory Bodies. If the agreements within CIS are not re-concluded in the bilateral format, this will result in more losses for Ukraine’s economy (in view of stopping duty-free trade and introducing non-tariff restrictions within WTO requirements) and complicate the terms of temporary or permanent stay of Ukrainians in CIS countries. In fact, a certain part of Ukrainians will not adapt to the changed conditions of staying in CIS and will have to return to Ukraine increasing the burden of labor market and social infrastructure. What is positive about all this is that most of the returned Ukrainians will be opposing the authorities. Besides, Poroshenko demanded denouncing some provisions of the Great Treaty between Ukraine and Russia with no practical benefit. This will just remove certain conflict of the law i.e. for Kiev Russia is an “aggressor-state” and “strategic partner” at the same time. The last wording did not hold Kiev from imposing sanctions on Russia and denouncing intergovernmental agreements unilaterally. Ukraine’s Security Council imposed additional sanctions against Russian privates and legal entities synchronizing the list with the latest list of U.S. Treasury Department. In total, as of April 2018, 44 out of 451 agreements between Ukraine and Russia were terminated. Perhaps, the government really hopes such steps will pave the way to Ukraine’s accession to EU and NATO. Noteworthy that Poroshenko plans to prioritize membership of these organizations by adding relevant provisions to the Constitution. Considering the “Balticization” process that started in Ukraine in 2014, they will introduce laws banning participation in integration unions with Russia, like Lithuania did yet in early 1990s. Besides, addressing the 11th Kiev Security Forum, Poroshenko focused on measures “to prevent Russia’s interference into any elections in the world.” He meant also the elections Ukraine will see next year. That is, if Poroshenko wins, it will mean that Russia did not interfere and the vice versa. Considering his low approval rating in the country and media reports about runaway MP Oleksandr Onishchenko’s corruption claims against Poroshenko, the latter initiated a procedure of establishing the so-called united local church and even met with Bartholomew I, the Ecumenical Patriarch of Constantinople, to that end. “This is not just about religion, this is about geopolitics. Establishment of the independent local church is as important for me as ‘visa-free’ regime, Association Agreement and our efforts to access EU and NATO. This is an issue of national security and defense in this hybrid war. The Kremlin considers Russian church as a major instrument to influence Ukraine,” Poroshenko said in the parliament on April 19. It is not clear yet whether Bartholomew I will provide Tomos of ecclesiastical independence - autocephaly. If he does, it will prompt a new wave of religious conflict in Ukraine and attacks on Ukrainian Orthodox Church (Moscow Patriarchy) will intensify. Strange as it may seem, Ukraine tries to maintain gas transit amid efforts to break all possible ties with Russia. Poroshenko speaks against construction of Nord Stream-2 at all possible platforms. This issue was on agenda of his talks with Angela Merkel in Germany on April 10. What German Chancellor said to comfort the Ukrainian president was that “Nord Stream 2 project is not possible without clarity of how Ukraine's transit role will continue.” Meantime, two weeks before Poroshenko’s visit to Germany, Nord Stream 2 AG received a pipeline construction and operation permit in Germany’s Exclusive Economic Zone. Here is how “the entire civilized world supports Ukraine.” In addition, on April 20, US Department of State Bureau of Democracy, Human Rights and Labor published Human Rights Report 2017, wherein it addressed serious human rights violations in Ukraine, including abuse of power by security officers and failure to punish those behind killings of Maidan participants. Earlier, Amnesty International addressed violations of human rights in Crimea and Donbass, existence of secret prisons of Ukrainian special services and unlawful detention of people, pressure on civil sector by the government. In April, Freedom House published Nations in Transit report praising some local self-government reforms in Ukraine, but emphasizing decline in development of independent Mass Media and civil society, high level of corruption, inefficient West-oriented anti-corruption agencies. For instance, specialized anti-corruption prosecutor Nazar Kholodnitsky is Vice President of the Football Federation of Ukraine headed by Andriy Pavelko, Head of the Parliamentary Committee on Budget Issues, MP representing the pro-presidential bloc. This is an evident conflict of interests. On April 26, 57 U.S. congressmen appealed to the Department of State over growing anti-Semitism in Europe, particularly in Ukraine. The congressmen believe that Ukraine’s “law on de-communization” dated 2015 glorifies the Nazi collaborationists and criminalizes denial of their “glorification.” This step of Ukrainian government has prompted nearly no response from the United States. 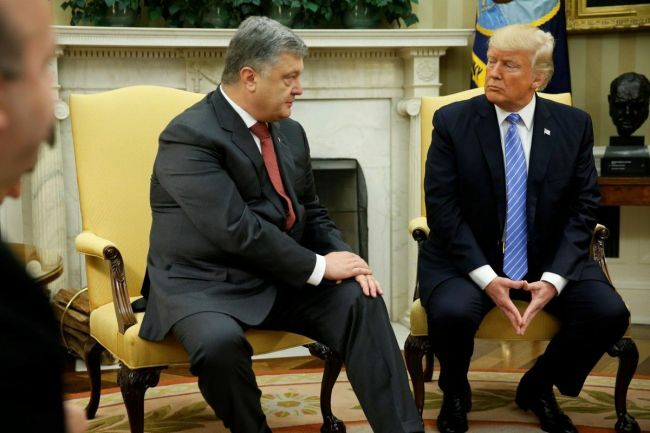 It is early to speak of any drastic changes in U.S. policy on Ukraine, the more so as Ukraine is on the periphery of Washington’s foreign policy irrespective of U.S.-Russia relations. Nevertheless, all this indicates that Poroshenko will hardly get foreign support at upcoming presidential election. 21.03 Why did the Ukrainian pilot “kill himself”?